Holy Thursday | ADULT CATECHESIS & CHRISTIAN RELIGIOUS LITERACY IN THE ROMAN CATHOLIC TRADITION: hosting ONLY True Christians!! !, or "How to think Catholic!!" sustinere Regem coelorum et Dominum. 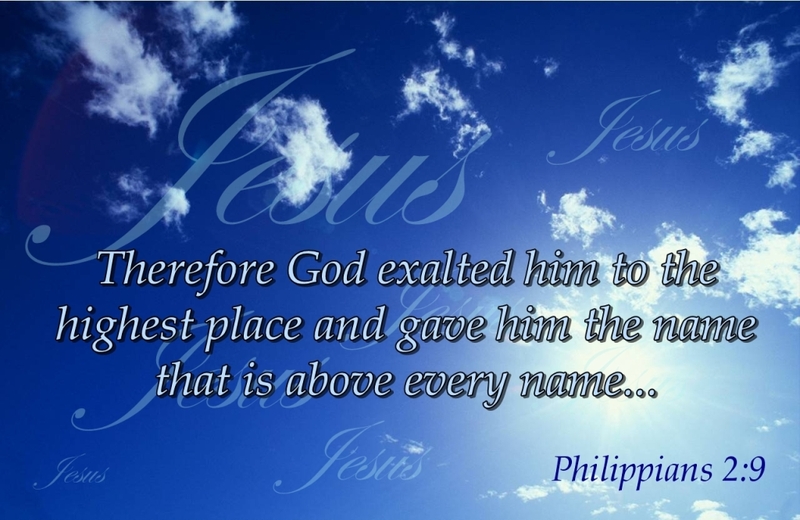 to bear the King of heaven and the Lord. -written 1086 AD, in both Irish Gaelic & Latin. The first and last line of each verse are in Latin, while the middle lines are in Irish (Gaelic). Written by the Donegal monk Maol Iosa O Brolchain. 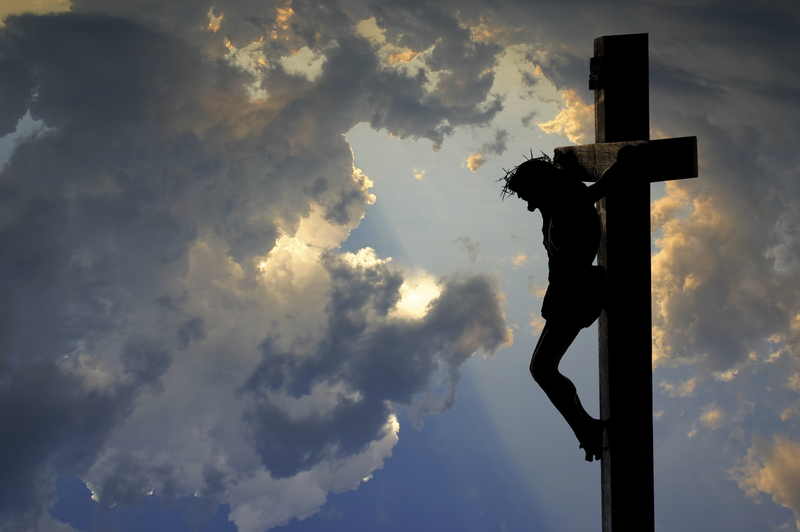 “…It is an arresting Psalm, with its shockingly exact prevision of the Crucifixion, centuries before the event took place. It was very much in my thoughts, about the time I “lost my faith” in Atheism, some forty-one years ago while crossing a footbridge in London, England – curiously enough on a Maundy Thursday. Now, in the teaching of Baha’u’llah, as Leach understood it, the New Testament is factually correct, and moreover, anyone who faithfully follows Christ’s teachings is ipso facto a Baha’i. This is not my understanding, but we will let it pass. 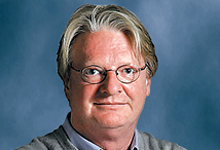 I was struck by the sudden bold defense of Christian belief, from a most unlikely source. “Without faith,” Leach argued, “art is a monkey’s game.” Conversely, I supposed, without art, religious ideas cannot be adequately expressed. This can be seen in all cultures: this departure from the commonplace, in the midst of the commonplace. Everywhere the divine is instinctively acknowledged in elevated language, and gesture. 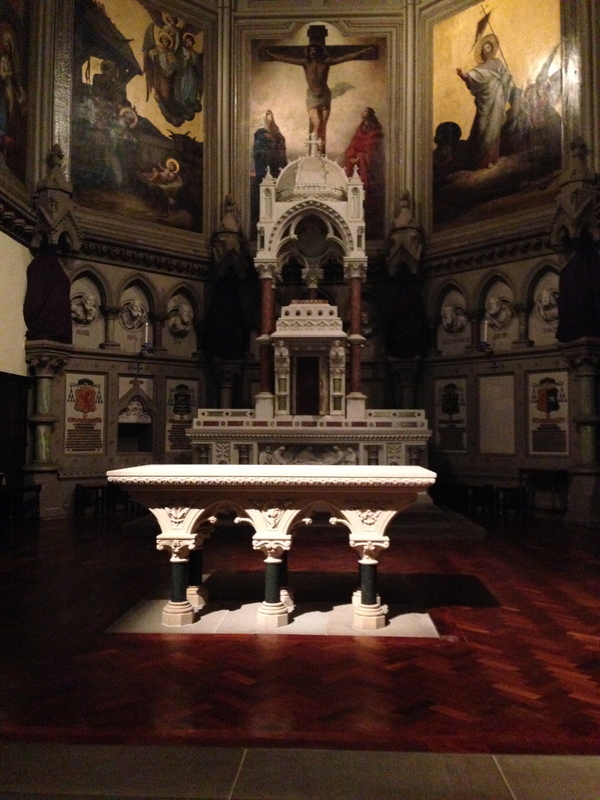 Liturgy – art – is essential to it. It is more than mnemonic; the Last Supper itself is not merely “remembered” in the liturgical events of the Triduum, or in the repetitions of the daily Mass. As the Catholic Church has continued to teach, the Real Presence transcends the historical event. Yet the historical event remains true within it. These things really happened; and by their nature continue to happen in a world that was altered by the coming of Our Savior. They remain true even if the truth is rejected, as it was in Christ’s time, is, and will be. We do not have “progress” in the profane sense; we do not have a progressive revelation. We have the truth of Christ, at the center of history and of our being, now and forever. He is what lifts us out of our mundane sinful lives, and conducts our attention to what is changeless, pure, and in every sense, higher. We return to this, or try to get away. To escape: into a world of our own making, and into a life where in our vanity we think that we can make the rules. Hell, which is discernible from Earth, is the putting of the greatest possible distance between ourselves and God. It is the reason Pride is the queen bee in the hive of the deadly sins; and in humility, Love becomes its opposite, theological virtue. It is the reason Love is expressed in acts of holy obedience, as we are resplendently told in the Magnificat. The return, to truth, begins in the acceptance of God’s will, even in denial of our own. 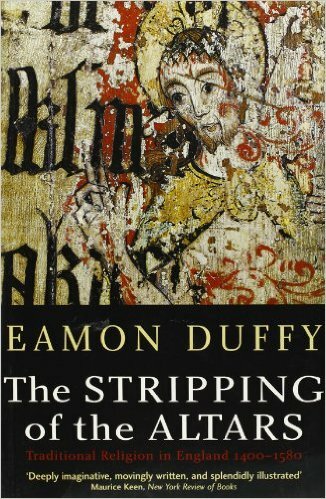 “The Stripping of the Altars” was used as the title of a book by Eamon Duffy, which has now been in circulation for a quarter century. It is a remarkable revisionist history of the English Reformation, which to my mind has grown in significance over this time. It challenges the myth and propaganda that has guided our thinking in the English-speaking realms, and beyond them wherever our influence has been felt. It is a variation, I think, on the pagan myth of Prometheus, who stole the divine fire, and put it at the service of his fellow man. In our variation, we have believed that the Catholic Church was tired and failing through the generations prior to a kind of “liberation”; that the Protestant faith emerged as a rekindling, a maturing, a coming of age in a spiritual Magna Carta. Henceforth we would no longer be captive to the authority of a dark and conniving priesthood, but free – to read the Scriptures for ourselves, to strip the churches of their encrusted decorations; to form our own judgments, and write our own prayers. We all share in this history, going back to Henry VIII, and striding forward through the reigns of Edward VI and Elizabeth I, when the medieval order was turned upside down, and the Catholic faith made capitally illegal. What Duffy showed, for this generation, as for instance Philip Hughes for an earlier one (in the three volumes of his Reformation in England, 1950 and 1963), was the evidence proving a huge, enduring, historical lie. The old order was robust to the eve of this revolution, which was imposed by force. The resistance to it from the people was profound; yet it failed – in England as elsewhere – under the violence of an emerging political power, directing theology to its own ends. Liturgical destruction at every level, extending to the dissolution of monasteries, the smashing of images, the torching of medieval libraries – was necessary to the creation of a brave new world in which the Church was placed at the disposal of Caesar. I, exquisitely, as a life-long Catholic have the privilege, too, of struggling with the literality of the Lord’s words, “This IS my body. 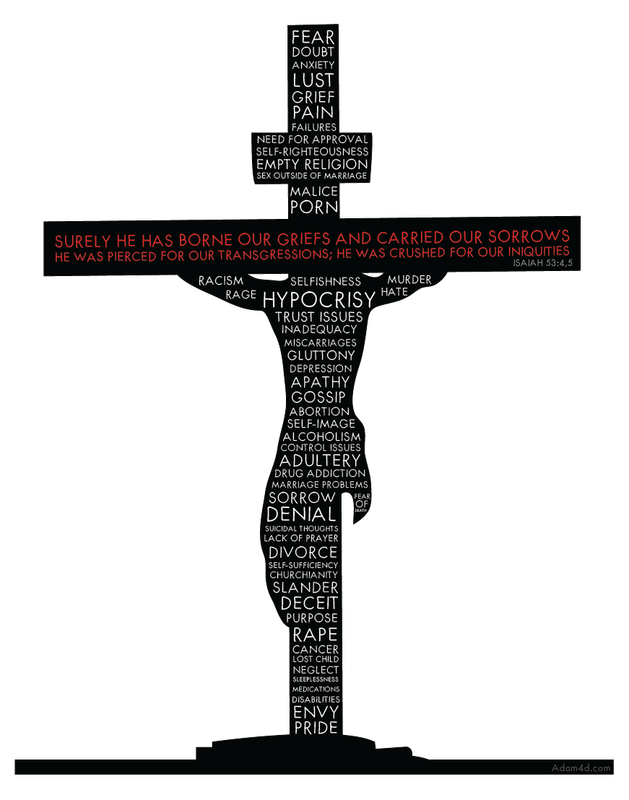 This IS my blood.” Imho, I don’t think Jesus meant these specific words to be a “no-brainer”. I believe He wanted humanity to spend the rest of its existence intently contemplating them, more than anything else He ever said, the centrality of it is such. Recall the Catholic definition of mystery, infinitely knowable. One of the most important and soothing, palliative things a Catholic can receive just before death is viaticum in the last rites. For as much critique as the Church may unjustly endure for not taking the Scriptures more literally, this she takes exquisitely literally. -by Jennifer Fulwiler is a host on the Catholic Channel on SiriusXM, and the author of Something Other than God, a memoir about her journey from atheism to Catholicism. Her website is ConversionDiary.com. “How could a reasonable person living in the 21st century actually believe that at the Catholic Mass, bread and wine are truly (like, not symbolically) changed into the body, blood, soul and divinity of Jesus Christ? This was one of my biggest stumbling blocks when considering Catholicism. When I first heard that the Church still believes that the Mass makes Christ’s one sacrifice at Calvary present here and now, that on Holy Thursday the Lord made it possible that bread and wine could be turned into the flesh and blood of God himself, I prayerfully thought: “Are you kidding me?” I’d never heard a bolder, more audacious claim made by a modern religion. There was a part of me that kept hoping I’d find that it was all a misunderstanding, that Catholics were only required to believe that the consecration of the Eucharist was a really, really, really important symbolic event. I was a lifelong atheist, after all. It was enough of a feat that I even came to believe in God in the first place. It was enough of a leap of faith for me to believe that some miracles might have happened a few times throughout history. But to ask a former militant atheist to believe that a miracle happens at every single Catholic Mass, that bread and wine are actually changed into the flesh and blood of Jesus Christ despite the fact that they look exactly the same… it seemed too much to ask. It is surprising, then, that when I consider how much my life has changed since my husband and I both became Catholic at Easter Vigil in 2007, I find that there is really only one thing to talk about: the Eucharist. I could try to pen a great ode proclaiming my joy at having come to know God on a level I never imagined possible for someone like me. I could write about the challenges we’ve faced, and the oasis that our newfound faith provided for us when we felt cast out into the desert. I could talk about the freeing power of Confession. I could say something about how my life is unrecognizable from what it was a decade ago. But when I started to write on each of those topics, I realized that each one of them — everything, really — comes back to the Eucharist. By the time I received my first Communion I had come to accept that the teaching on the real presence of Christ in the Eucharist is true. Or, perhaps more accurately, I was willing to accept on faith that it was not false. I was undoubtedly being led to the Catholic Church, and found its defense of this teaching to be compelling, so I trusted that it was true in some mysterious way, even though I didn’t really get it. That was the best I could do, and I never expected to understand it any more than that. Even as the years have rolled by, after receiving Communion week after week, I still don’t know how it works. I don’t often have a visceral reaction when I first see the consecrated host held above the altar, and don’t think I ever felt the Holy Spirit hit me like a ton of bricks the moment the consecrated host was placed on my tongue. Yet, despite the lack of immediate emotions, despite the fact that I can’t tell you exactly how it all works, I now believe with all my heart that it is true. I know that I eat the flesh and drink the blood of God at the Mass, and that it is the source of my strength. I know it for the same reason a baby knows that its mother’s milk is the source of its nourishment: the baby can’t tell you how the milk is created by the release of prolactin and the cells in the alveoli. He can’t tell you about the importance of immunoglobulin IgA and fat-to-water ratios. He couldn’t even begin to understand how and why the milk nourishes him if you tried to explain it. He just knows how very much he needs it. He knows that the mysterious substance that his mother gives him is the source of his strength as much as he knows anything at all in his little life. 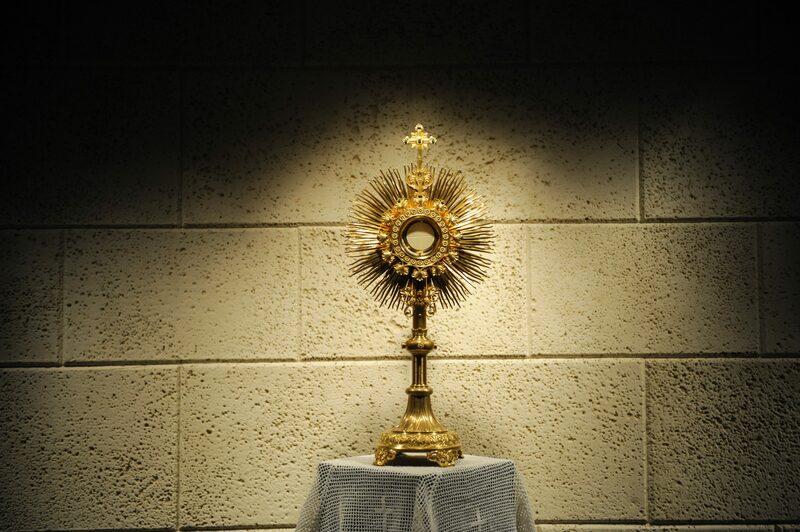 And so it is with the Eucharist and me. It’s not a particularly eloquent defense of the Eucharist, but that’s about the best I can do. The way this Sacrament has slowly transformed my soul and given me a connection to God that I never knew before, the way I could easily move myself to tears at the thought of not being able to receive it, the strength I have drawn from having this direct communion with God – if these things are not real, then nothing is.